In the last few days there’s been a Twitter hashtag going round, #2016top3, for your favourite 3 landscapes of the year, and as I had joined in I thought it was a good excuse to get myself back into posting to this blog. I like to get up to Borrowdale early each November. It can be risky, and last year I got one day of sun and mist followed by a week of solid rain. Or you can be too late and a big storm has blown away all the leaves. But this time I really hit “peak Autumn”. The landscape was full of autumnal colour, and mist / fog / sun / snow had been perfect conditions for photography, but this picture came on the one day when it was raining and I was just taking it easy. That morning during a break in the rain I spent an hour or so playing around with close-ups of the carpet of red maple leaves in the back garden. Sun kept breaking through, and I remember noticing a rainbow over Castle Crag, but it soon vanished and I would have been perfectly satisfied if those red leaves had been all I’d photographed that day. 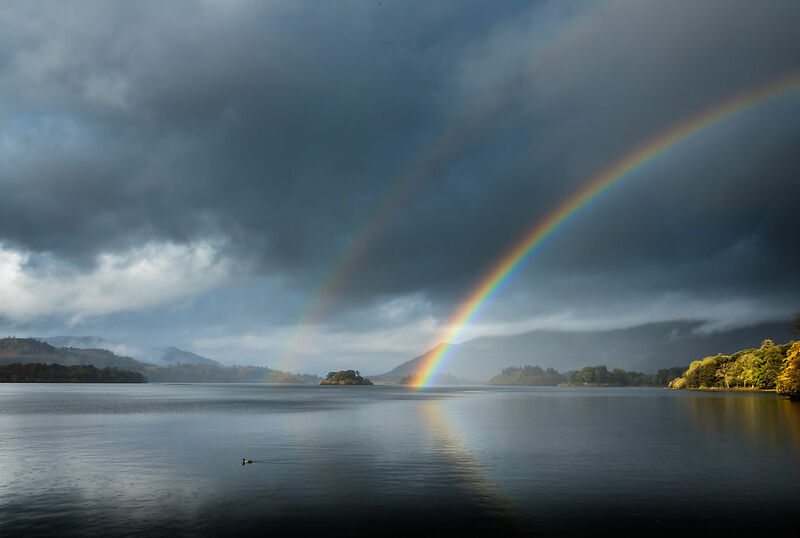 So when I set off for Keswick I wasn’t thinking of rainbows – it just seemed a good time to nip into Booths supermarket. Nothing in particular made me stop as I passed Ashness jetty, just the thought that the day was short, but the rainbow appeared the very moment I went down the steps. The picture was taken on my Fuji X-T2 (I’m preparing a hands on review) and was only gently adjusted in Lightroom. At the time I was awestruck by the brightness of “the rainbow” and I didn’t even notice the second one. It just left me thinking that with photography sometimes it’s inspiration that comes looking for you.